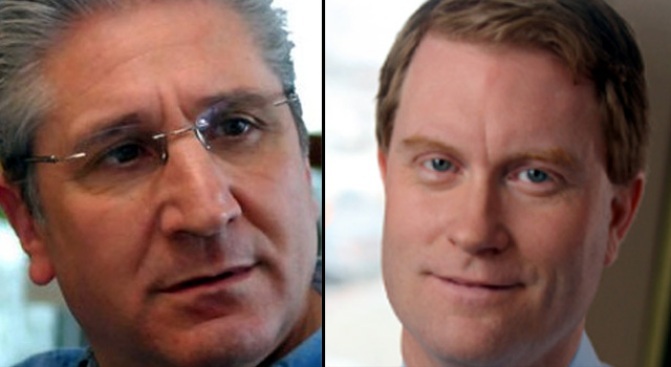 Jim Tedisco (left) and Scott Murphy are battling for Kirsten Gillibrand's recently vacated U.S. Senate seat. After a short, tense campaign, the New York congressional race focusing on President Barack Obama's economic policies is so tight it may be decided by absentee ballots. With 99 percent of the precincts in the 20th Congressional District reporting, Democrat Scott Murphy leads Republican Jim Tedisco by 81 votes out of 154,000 cast. The race is to replace Democrat Kirsten Gillibrand. Businessman and political newcomer Murphy and national Democrats staked his campaign on the strength of Obama and his economic policies, specifically his $787 billion stimulus plan. Tedisco, an Assemblyman for 27 years, attacked Murphy for supporting the stimulus plan, which he said allowed massive bonuses at the bailed-out insurer American International Group Inc.
Gillibrand was appointed by Gov. David Paterson in January to succeed Secretary of State Hillary Rodham Clinton in the Senate. The special election drew an unusual level of national attention, and both candidates had financial support from their national parties and political action committees — mostly spent on increasingly negative television ads, which bothered supporters of both candidates. "I'm tired of candidates telling us what's bad about the other person instead of what's good about them," said Ralph Liporace, a 53-year-old independent who voted for Murphy at the Brunswick Volunteer Fire Department. Vincent Poleto, 21, of Brunswick, said he voted for Tedisco "because I've known him for years." "But I'm not happy about the negative campaigning," he said. Despite ongoing campaigning and get out the vote efforts, polling places and local election boards reported light turnout, not unusual in a special election where there are no statewide offices or big names on the ballot to attract more casual voters. There were more than 10,000 absentee ballots issued and about 6,000 returned by Tuesday, none of which were to be counted Tuesday night, according to state elections officials. New York agreed to count overseas absentee ballots until April 13 — instead of the initial April 7 cutoff — after the U.S. Department of Justice sued the state for not giving overseas absentee voters enough time to return ballots. Republicans hoped a win would knock Obama off balance and put them back on the political map in the Northeast after two dismal cycles that saw them go from nine New York representatives before the 2006 elections to three after the 2008 vote. Republican National Committee Chairman Michael Steele identified the race as one of the party's top priorities for this year. Democrats looked for the reassurance of a win in a Republican district less than 100 days after Obama took office and in the wake of his $787 billion stimulus package, which was criticized for a loophole allowing bonuses for executives of the bailed-out American International Group Inc. insurance company. Even hours before polls closed, the White House was portraying the vote as a win for Democrats no matter the outcome because of inroads they have made in the district, which has more Republicans registered and a long history, until recently, of electing GOP candidates. "To even be competitive in a district like that, I think says a lot," press secretary Robert Gibbs told reporters on Air Force One as Obama traveled to London. Each campaign raised more than $1 million and got major support from national committees and political groups. Murphy, 39, is a venture capitalist multimillionaire from Columbia, Mo., who has lived in New York for more than a decade. Tedisco, 58, is the GOP minority leader in the state Assembly. He's been in politics for 27 years representing a mostly working-class district. He doesn't live in the congressional district, an issue used by Democrats during the campaign. The diverse district stretches from the rural Adirondack Mountains, an hour south of the Canadian border, down to Dutchess County, about an hour north of New York City. Pat Ginsberg, a Democrat who said she was in her 60s, voted Tuesday morning at the Martin Van Buren National Historic Site in Kinderhook, southeast of Albany. "I wanted a Democrat because I wanted someone who backed Obama's policies," she said. John Johnas, 62, an independent from Rensselaer County, said Obama's policies didn't figure in his decision to vote for Tedisco. "I've always liked Jim," he said. "He's at least from the area. I don't know much about the other guy."